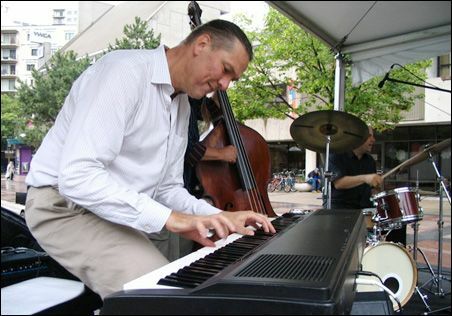 The 10th-annual Twin Cities Jazz Festival starts this weekend, which means Jon Weber is coming to town. For nine of the festival's 10 years,Weber has been its resident piano player. He calls himself the festival's "utility infielder." Festival executive director Steve Heckler calls him "one of the top pianists in the country." Weber isn't famous, as he'll tell you himself, but he should be, and if there's any justice he will be. He has a vast library of songs in his head, any of which (whole or in part) can travel to his fingertips in an instant. Hum a jazz or pop tune and he'll tell you the title, composer, and year it was written. He has perfect pitch; ping on a glass and he'll play a song in that key. He can solo, back a singer, or lead a group. In the words of jazz pianist and Sirius radio host Judy Carmichael, "Jon is one of the most imaginative musicians in the business, equally smitten with all styles of jazz." Chicago Public Radio host Steve Edwards once asked Weber how many songs he knows. 40,000? "Nowhere near," Weber demurred. "I made a list a long time ago ... I think it was 20,168. But I didn't say I knew 20,168 good tunes." Weber's passion for music began at age 3, when his father brought home a toy organ. While other kids stacked blocks or crashed toy trucks, young Jon went to work on that organ, spending hours picking out tunes and playing his own versions of songs he'd heard on his Dr. Seuss and Bugs Bunny records. When his grandmother gave the family her old player piano and piano rolls, Weber played along, following the moving keys with his fingers. By age 6 he had learned almost 2,000 standards. As a teen he scribbled musical ideas on scraps of paper, envelopes, and in the margins of his textbooks. Some were multi-clef orchestrations. Many later became the songs on "Simple Complex," the CD he released on his own label in 2004 that was named the No. 1 Jazz CD of the Year by the Chicago Tribune, Swiss National Radio, Norwegian National Radio, Estonian National Radio and BBC Online. By age 19, Weber's jazz quintet, playing all original music, had opened for Pat Metheny, Buddy Rich, Freddie Hubbard and Stanley Turrentine at various jazz festivals. He has since toured the world, performed to a sold-out Carnegie Hall four times, written arrangements for the Milwaukee Symphony Orchestra, scored extensively for television, and penned 1,200 jingles, 20 of which aired during Super Bowls. He composes and arranges music for the Reduced Shakespeare Company, which condenses epic works like Shakespeare's plays and the Bible into short, sharp comedies. He does not own a television, preferring to trust his own observations. In February 2006, when Weber was performing in Florida, Dave Brubeck wandered in and left a signed note saying "There's nobody in the world who plays like this guy." In sum: Weber is a former child prodigy mad genius jazz pianist, but affable, and very much a crowd-pleasing entertainer. At this year's jazz festival, Weber is scheduled to play four gigs. He could easily end up playing more - if another pianist bails, if there's a gap in the program, if someone asks him to sit in. "Whatever Steve wants me to do, I'm there," he says. "I can't say enough about Jon," Heckler says. "He has saved [the jazz festival] a few times. ... Here's a prime example. We had a trumpet player and his brothers come up from Alabama. Jon was already booked for four sets, and the brothers showed up short a piano player. I looked at Jon, he had just gotten done with a set, he walked up there, they called a tune, and he played it. Even with their original stuff, he felt it out, made it work and never complained. ... People love the guy. He's a decent guy. A fun person to hang with and work with." Weber holds Heckler in equally high esteem. "He's the ideal jazz fest manager," he says. "He pretty much takes whatever live grenade is handed to him and turns it into something magical. ... He knows how to make everybody feel willing and eager to participate. I can't wait to come back every year." The reason Weber didn't play the first Twin Cities Jazz Festival is simple: He and Heckler didn't yet know each other. In 2000, year two of the festival, the Global Harmonica Summit came to Minneapolis at the same time. "Weber was their resident piano player," Heckler recalls. "At the jazz festival, he and [harmonica player] Howard Levy ended up on stage with Jack MacDuff. Jack would call a tune and Weber would play it. As I watched him, I realized he could do just about everything. He could back up anyone." Now based mostly in New York, Weber will arrive in the Twin Cities on Tuesday, June 24, where he'll play stride piano at the Dakota with our own Butch Thompson and Paul Asaro, a pianist from Champaign, Ill. Weber has played with Asaro before but never with Thompson. Heckler hopes to have two pianos on the Dakota stage. On Wednesday, it's off to Christ the King Lutheran Church in Bloomington, where Weber will join Connie Evingson and the George Maurer Group on the front lawn. "Connie requested Jon," Heckler says. What's on the program? As usual, Weber is open. "I pretty much know everything Connie has ever recorded, and I told her it's all good -- do whatever you want." On Thursday, it's back to the Dakota with bassist Adam Linz (of Fat Kid Wednesdays) and drummer Joe Pulice. On Friday, the trio moves outdoors to Peavey Plaza. Between planned and impromptu gigs, there should be time for one of Weber's favorite Twin Cities destinations: Hell's Kitchen. According to Heckler, "He loves the peanut butter."